An investigative series by the New York Times and a performance piece by Mike Daisey featured on This American Life have put the spotlight on Foxconn, the Taiwanese company whose massive Chinese factories manufacture some of the world’s most popular consumer electronics. 40: Estimated percent of the world’s consumer electronics manufactured by Foxconn. 7: seconds it takes Foxconn’s workers to complete a single step of their work, according to a survey cited by the New York Times. 13: age of a Foxconn employee Mike Daisey interviewed outside the gates of a Foxconn plant in Shenzen. 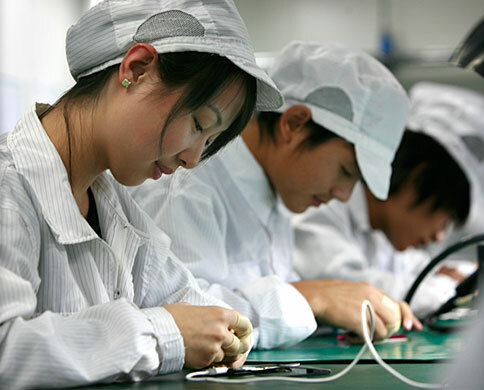 91: cases of underage labor found by Apple’s audits of its suppliers in 2010, the year Daisey visited China. 3,000: number of workers Foxconn could hire overnight, according to Apple’s former worldwide supply demand manager. 10-20: percent estimated monthly turnover in Foxconn’s workforce. $5.7 billion: Terry Gou’s estimated net worth as of March 2011. 230,000: number of workers at “Foxconn City” in Shenzen, according to the New York Times. 70,000: number of workers at Foxconn’s Chengdu plant who live in company dorms, according to the New York Times. $450: monthly salary a worker involved in that protest said employees had been promised for moving from the Foxconn campus in Shenzen to one in Wuhan. $150,000: approximate amount the company wired Lai’s family after he was killed in the aluminum dust explosion.